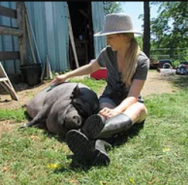 Founded in 2004, we provide a safe haven for abused, abandoned and neglected pot-bellied pigs, cats, dogs and farm animals. We offer humane education programs, as well as anthrozoological experiences to individuals and small groups. Ralphy's Retreat also provides Animal and Equine Assisted Interaction programs to meet the spiritual, emotional, physical and mental well-being of individuals, families or small groups.